Authors submitting manuscripts to academic journals often spend valuable time rekeying information that is already included in their manuscript documents. 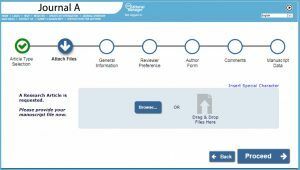 Editorial Manager’s Xtract saves Authors’ time by pre-populating metadata fields using data from their submitted manuscript file, reducing the time it takes to complete the submission process and eliminating rekeying of information. Watch a short overview video to see how it works. Editorial Manager’s Xtract automatically extracts key metadata from Authors’ submitted Microsoft Word documents to automatically populate key system fields. Xtract simplifies submission by reducing the amount of time Authors spend re-keying submission data, and leads to more accurate submission metadata for publishers. The Xtract interface combines early XML workflow with an updated, elegant design for increased efficiency. Watch these helpful videos to learn more about Xtract. Already an Aries customer? We’ve created a designated testing site for current EM users to try out the new interface. Contact your account coordinator for more information.